Note, this is a prior version of the shoe, used pretty hard for a few years. 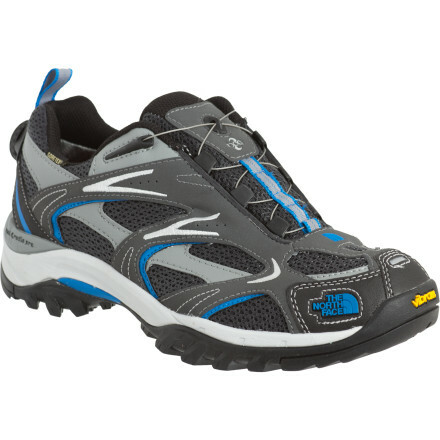 Good support, use of running shoe technology, and foot protection in a trail runner. Gore-tex has been more reliable than in other trail runners for me. The aggressive tread is very good. This version would have benefitted from more lateral support, a better insole, and better laces. I rotate between relatively heavy hiking boots and trail runners, depending on my needs. Trail runners have a much shorter usable life than leather hiking boots, and I walk a lot, so I tend to wear out trail runners fairly quickly. 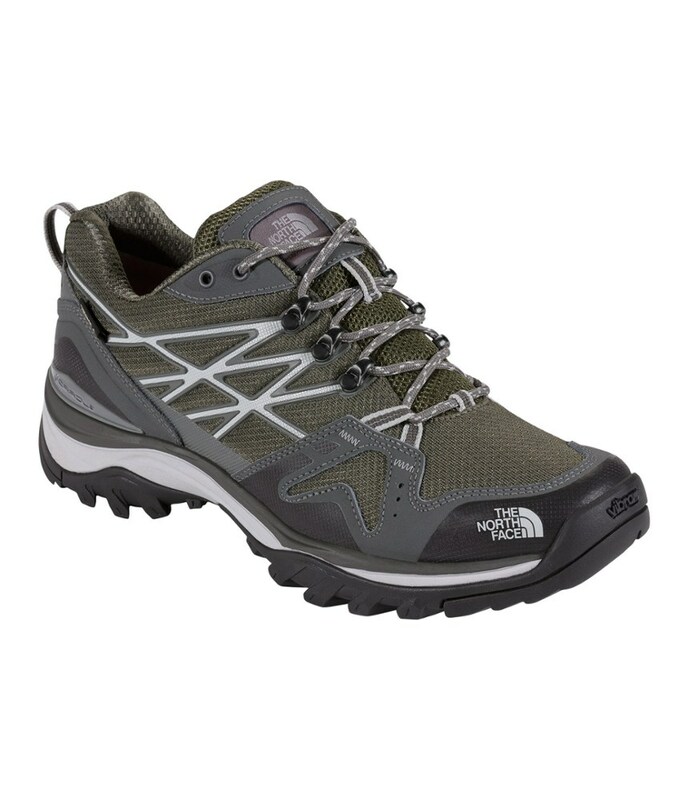 I have yet to find the perfect trail runner for me, but The North Face Hedgehog GTX is a shoe worth considering, and has been updated some since I purchased this pair. The last of this shoe is straightforward: average width, average volume, relatively normal arch support and correction for overpronation (pronation is the extent to which your ankle tends to lean inward when you walk or run. Overpronation is a typical challenge for people with heavier builds and low arches or flat feet). Because my feet are kind of wide in the front, and because I really hate banging my toes against the end of shoes when I'm going downhill, I tend to buy trail runners with this kind of last a size larger than normal. That solution worked well for the Hedgehog. I usually wear these with light running-type merino wool socks; on colder days, I can wear thicker socks, but there is not a lot of extra volume for that inside this shoe. 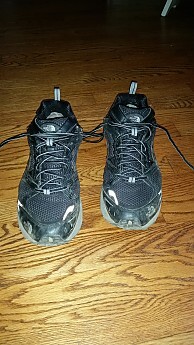 The laces run through holes, like a typical running shoe, and they lace all the way up, with an extra set of holes at the top, near your ankle, if you like a more secure fit. The holes are reinforced with a soft kind of plastic that has kept them from getting deformed but has not cut into the laces. Speed laces would have been nice, but the laces work fine for the most part. The laces themselves are plenty long and very durable, but they are very slick — they routinely untie unless I double-knot them. For my foot, I would probably prefer a shoe with slightly more room in the forefoot, but that's an individual issue. 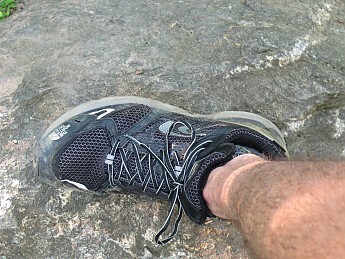 I have hiked in Salomon trail runners that were a tad too narrow and squeezed my feet. The Treksta Evolution trail runner seems to fit the front of my foot better, but I have had other issues with Treksta's shoes that caused me to look elsewhere. 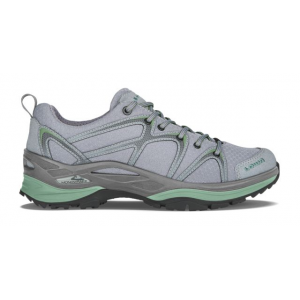 This is a comfortable shoe that you can wear on trails pretty much right out of the box. No break-in required. This shoe provides very good support. 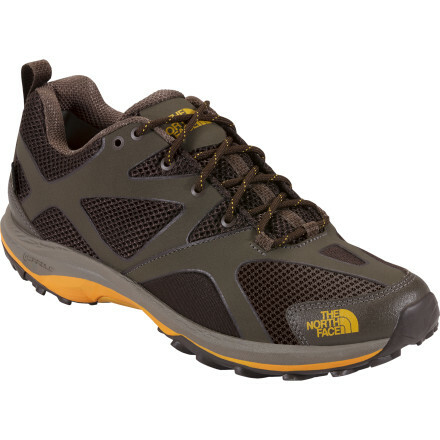 Note that I have very flat feet and wear doctor-made orthotics to correct my stride, but the materials The North Face used for the midsole and sole are very solid, with stiffer EVA foam material on the inside of the foot and some kind of air pocket under the heel. The heel has a pretty firm counter (the hard part of the heel that cups your foot), including a plastic reinforcement on the outside. The shoe appears to have a light half-shank, probably plastic of some kind, under the rear half of the shoe, and it claims to have some kind of "plate" to protect your feet against sharp rocks underfoot. 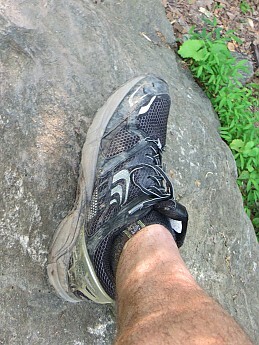 I think this shoe provides average protection from pointy rocks for a trail shoe. 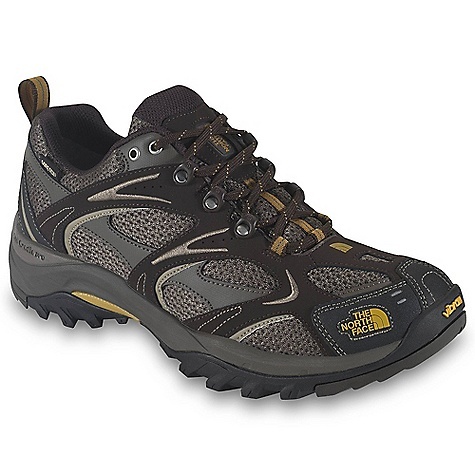 Decent, but nothing like a solid pair of hiking boots with a stiffer sole and midsole. The shoe could have benefitted from some improvements. Lateral support for this version of the shoe is fine but not great; it looks like more recent versions employ more leather reinforcements along the side of the shoe. Likewise, the insoles that came with these shoes are virtually useless pancakes. Perhaps the insoles in the newer version offer something more. I usually hike these with a light load, nothing more than 30 pounds, for the most part. As with any low trail runner, this has no ankle support and would not be my choice for heavier loads or more jagged terrain. A high point. My experience with Gore-tex trail runners and light hikers has been very mixed. The Gore tex 'sock' or bootie in these kinds of shoes is subject to a lot of stress, and I have had multiple shoes from multiple brands experience leaks as the Gore-tex stretched and (likely) ripped at some point. After a couple of years on trails, these shoes still keep water out. 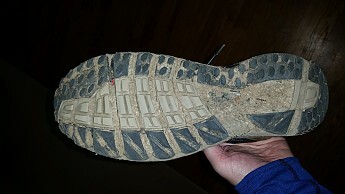 As far as breathability, it is typical for a Gore-tex trail runner. On hard hikes in warm weather, I can see the mesh getting damp, so moisture is definitely getting out. Also, my feet don't feel overly wet hiking in these on warm days. That said, I haven't found a Gore-tex trail runner that allows sweat to escape as well as non-Gore-tex shoes, and my experience with this shoe is consistent with that. Large patches of mesh do help with ventilation. Another high point. Aggressive tread under the front part of the foot, and the sole has proved to be very durable. Note that I really don't use these much on pavement. They live primarily on dirt tracks, mud, and rocks. The soles do a reasonably good job shedding mud, but some does collect. Very good. The midsoles are starting to feel less cushioned, which is typical for any shoe with an EVA foam midsole. The soles have pulled away from the toe of the shoe, but just a little. This happened well over a year ago, which was a concern, but they only pulled away a little and stopped. I could have fixed this with shoe goo if it had been anything more than cosmetic. I have worn these shoes a lot. 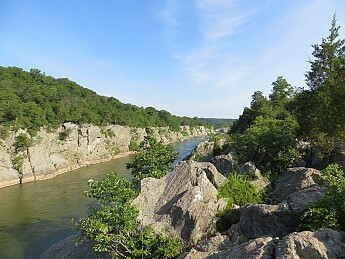 The photo above is a typical trail along the Potomac River, where I have used these shoes for dozens of day hikes. I have conservatively put at least 500 miles on these shoes, in conditions ranging from low 30's and light snow to steamy Washington, D.C., afternoons to really hard thunderstorms. I have worn them on a few overnighters where I was not carrying a lot of weight, and they were fine. As with any Gore-tex shoe, I bring some newspaper to crumple inside them and dry them out if I end up hiking in the rain. While they are probably due to be replaced, I wore them this weekend on the trails and was feeling fine — no shoe or foot issues. I'm still looking for the perfect light trail shoe for me. The Hedgehog is a capable, better-than-average trail runner with some very good qualities and some room for improvement too. Nice review, Andrew. As hot as my feet get running, I can't imagine a GoreTex trail runner. Sounds like a good hiking option, however. Thanks for a solid, helpful review, Andrew. Thanks for the review. I own a pair of Asics GTX trail runners (almost 8 years old now) that look pretty similar. I've used them mostly for hiking and been very pleased with them, but they are due to be replaced. I for one like GTX trail runners. I've never owned a pair of TNF shoes myself, but I know a person who does and he wore them until they fell apart. Nice review, Andrew! This is one of the best shoe reviews I've seen. Great review, Andrew! I use the shoe for hiking trails in Colorado especially during snowing and wet conditions. The Gore-Tex works terrific and kept plenty of water out. However, I absolutely don't like the shoe strings that come stock with the shoe. The shoe comes untied very easily even after double knotting them. The North Face women's Hedgehog shoes are great. They are Goretex and waterproof. Very durable shoe. Great fit and arch support. Want option for high top! I love my Hedgehogs. I can wear them for everyday use but also out on the trails. They are waterproof and provide plenty of support. One of the few shoes that don't give me blisters. I've worn them hiking all through Patagonia and Iceland and never had any issues. I like the fit so much I wish they also had the option of mid height or high top hiking boots. This is simply the best light hiker I've ever worn. This is simply the best light hiker I've ever worn. I am currently killing my 5th pair. These light, grippy shoes are rugged enough for most anything and the Gore liner keeps out the morning dew. The Hedgehog is dirt ready right out of the box. The Hedgehog is light, grippy, provides good protection from the elements and hikes well on almost any terrain. This has been my shoe of choice for three years. Considering what the shoe was designed for, I can't find anything to complain about. I'm sold on the Hedgehog GTX. The TNF Hedgehog GTX has been my only light hiker for the past four years. I've put this shoe through hell and I'm currently in the process of killing my 5th pair. I typically get 300-500 miles out of a pair. The Hedgehog laces up well, has a comfortable and snug heel, and plenty of room in the toe box. Lightweight, grippy, and totally capable right out of the box, I'll keep buying this shoe as long as The North Face makes it. Bought these for walking my Newfoundland dog. I live in west Norway and we get more than our fair share of rain. These shoes are two months old (or more accurately I bought them two months ago). The grips/treads on these shoes is surprisingly good; especially on wet stones and wet grass. Build quality is good. But the main reason that I bought these shoes was to keep my feet dry; these shoes have only been used for walking my dog (i.e. no approaches to climbs or any similar demanding activity) and the Gore-tex lining has already parted and my feet get wet. This is very disappointing and now I've found the receipt, the shoes are going back tomorrow. 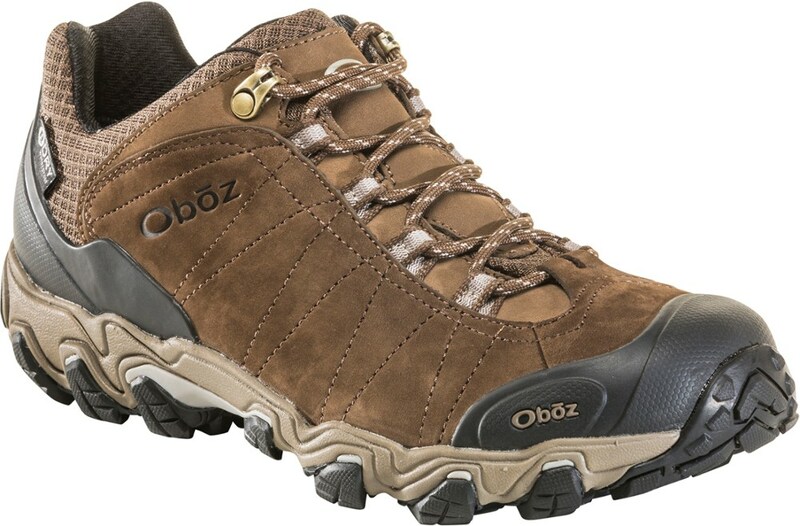 If the Gore-tex lining isn't high on your priority list then these shoes are good; if you need the Gore-tex lining then from my experience I have to say that they are rather poor. Sky-diving in Fiji, woodland hikes on 6 continents, island (rocky) hikes in Fiji, glacier trekking in New Zealand, jungle hikes in Thailand, a hike in the Himalayas, hiking up sand dunes in the Namib Desert, Sahara Desert hiking, brick street walks all over Europe, hiking around Macchu Pichu, rock-climbing in Laos, bicycle riding all over the world, etc. The shoes held up throughout the entire trip and are still usable (though they are a bit heavier because of all the accumulated dirt and sand). These shoes are GREAT! Love them. Ahh... remember the days when North Face was synonymous with quality; you never ever had to question the quality of this specialty outfitter. You just paid the extra price and you knew that you had purchased the best. Thus, I have been buying North face products ever since I could afford them. They are supposed to be the products for serious outdoor people....a step above Columbia. You pay for quality...right? Not anymore. My last NF purchase was a disappointment but I thought I would give them another try. At first I thought these were the best pair of shoes I ever put on in years. They are light, snug..but not too snug...you know the "right shoe". I planned to use them for some long portages in the BWCA. So...my confidence in NF was immediately restored but after only after a few weeks of walking around (50) miles around my local park, I couldn't believe what I was seeing and feeling.The soles were at least 30% gone. Yes, I am larger than the average (200 lbs) and walking on pavement but come on! Oh and by the way, these things leak like a sieve. They claim to be waterproof and are made of Gore Tex®; I'm sorry to say that they are not even water repellent. (Very misleading advertising) You learn real quickly to avoid even the smallest puddle. This isn't good for the Boundary Waters...so I moved back to my old Columbia shoes. You will note that this is a common complaint among other reviewers/customers. I learned this AFTER I PURCHASED THEM FOR $100 bucks. I never thought NF would succumb to this type of business practice like so many others. They went from a trusted specialty outfitter to generic junk merchant in only a few short years, very sad. Look around for other products...until NF decides to reverse back. I bought my Hedgehogs on 25/04/2010 and they were very light and comfortable. However after 12 weeks the shoes had split around the toes and were leaking badly. They were initially waterproof but were not very sturdy and were a big disappointment. I certainly would not buy North Face again because for £85 a pair you would expect better. It is now the first week in August and I am taking mine back to Millets in Warrington today, which is where I bought them from...so don't be tempted. They are rubbish. I would recommend leather shoes or boots for serious walkers and certainly not North Face. Man I can't express how much I love my low cut Hedgehogs. Man I can't express how much I love my low cut Hedgehogs. I move around a lot as a plant collector into some rather remote places in search of the kind of plants that don't wanna be found. I have been using other trail shoes and boots, but they never work out after a few days, and my feet start looking like crap. I bought a pair of Hedgehogs for an extended trip to Japan hiking all over the place. 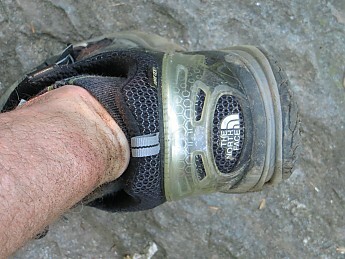 I never got one blister (maybe luck) The gore-tex lining never split on me even on some very tough terrain. My feet were always dry and when any water got inside they were able to dry out quite fast. One of the things that surprised me the most was for such a light shoe they took such a beating. The grip was second to none for me. 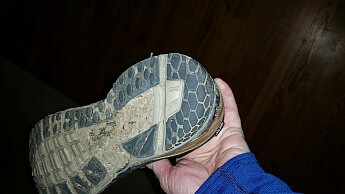 I also like the hard plastic strip that runs down the bottom of the shoe that takes a lot of the stress off the soles of your feet when hiking up steep scree or rocks. Great lightweight trek shoe. Warm, good breath-ability. Warm, good breath-ability. Not as waterproof as could be. needs to be more durable 10days trekking commercial tourist trails in Nepal, 5 days trekking jungle trails in India left sole very worn & separating from upper at front and stitching starting to come loose. Finished an Appalachian thru hike in a pair of these. Finished an Appalachian thru hike in a pair of these. I had Montrail Hardrocks before the Hedgehogs. They were comfortable, waterproof, good traction, and lasted me the 500 miles I needed. The only down was the sole at the toe started to separate sooner than I thought appropriate. Kudos to North Face. These days I am not really into top-notched brands because of their poor quality, and the only reason people buy it is because of the brand name.. But for this review, it all changed that. I am into long day hikes and haul a lot so I looked for a trail shoe that is lightweight and durable, plus some Gore-tex and perks in it. So I got myself these pairs for $130. I thought first the sole would wear out easily because of its lightness factor but to my surprise it withstood some of the worse terrain here in the Philippines, some of its knobs got off though but the whole thing is solid up to know. Its waterproofness and breathable mesh proved tremendously reliable and the only thing bad about it is it's too light that you won't feel your wearing one. Overall, more than 2 years of usage, I think I'm gonna buy another one of this. This would be a good shoe if it was more durable. This would be a good shoe if it was more durable. It has excellent traction, almost no break in period, good waterproofness, and very comfortable. Durability however is poor. After one trip canyoning several tread lugs were missing, some were breaking and the soles were already starting to come off. These are good shoes. They were good right out of the package. After a few hikes the original inserts were shot and i had to put in Superfeet. They have been good since then. My only problems are that the uppers are wearing out fast and they have become more stiff the more that i use them to the point of being uncomfortable. From the gym to the trail and everywhere in between these shoes do the job. The vibram sole hasn't shown any sign of wear after 7 months wear. I wish the lugs were deeper for more traction though. The waterproofing seems good until I wash them thoroughly in the tub and water gets through somehow. I like them overall. The fit is normal to wide. I'm filing this addendum. I will not buy North Face shoes again. It's not that these have turned out that badly - the stitching and so forth is fine after a few months' use, the traction is good, they still look fine, and as far as I can tell the waterproofing is pretty good. 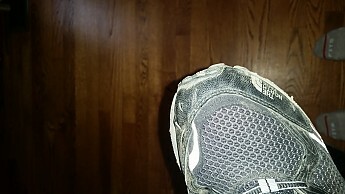 But they are starting to feel clunky and have lost a lot of what cushioning there was. The uppers feel too stiff to me and overall I am not that happy with the breathability. If I really hated them, I would take them back to REI. I don't, but there are a lot of good shoe brands out there and I will probably go somewhere else next time. I've had these for about two weeks now and so far am very happy. Although I haven't taken them out on any trails etc, we have had some wet and snowy weather and my feet have stayed warm and dry. I've also felt confident about my footing with the vibram soles. Since they are waterproof, these are obviously not going to be as breathable as a pure trail runner, but so far so good. The North Face Hedgehog GTX XCR is not available from the stores we monitor. It was last seen May 11, 2014	at Rocky Mountain Trail.